By Gary E. Myerson, MD | Arthritis & Rheumatology of Georgia, P.C. Dr. Myerson is a Founding Fellow of the American College of Rheumatology and is an active participant of the Arthritis Foundation. ColciGel® is a new option for treating acute flares of gout. It is a transdermal gel that contains colchicine (colchicinum 4X) and is designed to be applied directly on the sites of a flare. Clinical experience has demonstrated the effectiveness of ColciGel in reducing inflammation and pain associated with acute flares. ColciGel patients report a 50% or greater decrease in pain and inflammation within a few hours and improved pain relief with additional applications. ColciGel application is well tolerated as only non-clinically relevant concentrations of colchicine enter systemic circulation. ColciGel, with direct application on the site of the flare, bypasses the gastrointestinal (GI) tract and has limited absorption into the systemic circulation, two sites of significant tolerability and safety issues common with oral colchicine. In this paper, the pharmacoeconomics associated with treating acute flares with ColciGel and oral colchicine are examined. The drug costs for the two treatments are very similar, however oral colchicine therapy has the potential for large hidden costs associated with poor tolerability, serious adverse events (AEs), drug-drug interactions (DDIs), and treatment-failures. ColciGel, without these hidden costs, should be a much more cost-effective treatment. A new agent, ColciGel®, has recently emerged for the treatment of acute flares of gout. ColciGel is a transdermal gel preparation of Colchicinum (colchicine in its homeopathic state) that is applied topically. ColciGel contains Colchicinum 4X in a proprietary Organogel that is applied directly to the site of acute flares. It is supplied as an airless 15ml container that delivers 0.25 ml of ColciGel per pump. 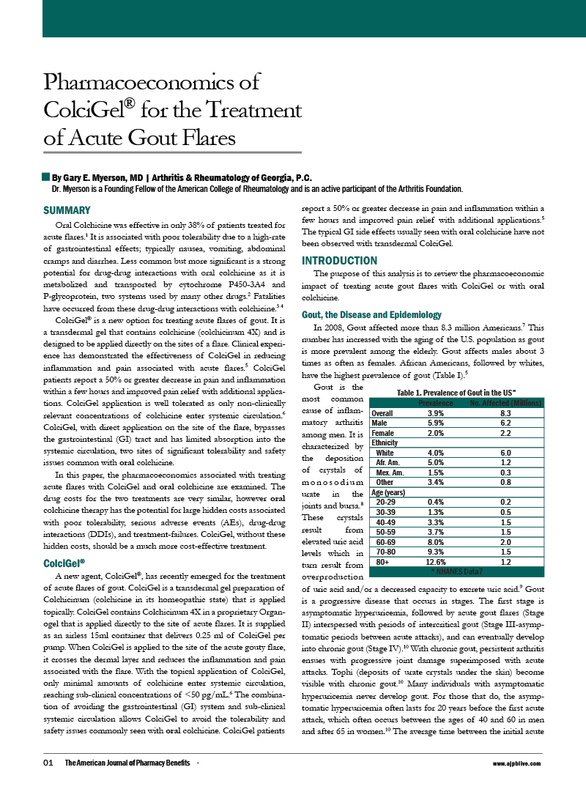 When ColciGel is applied to the site of the acute gouty flare, it crosses the dermal layer and reduces the inflammation and pain associated with the flare. With the topical application of ColciGel, only minimal amounts of colchicine enter systemic circulation, reaching sub-clinical concentrations of <50 pg/mL.6 The combination of avoiding the gastrointestinal (GI) system and sub-clinical systemic circulation allows ColciGel to avoid the tolerability and safety issues commonly seen with oral colchicine. ColciGel patients report a 50% or greater decrease in pain and inflammation within a few hours and improved pain relief with additional applications. The typical GI side effects usually seen with oral colchicine have not been observed with transdermal ColciGel. Please download the PDF for the full article. Mullins, M., et al., Unrecognized fatalities related to colchicine in hospitalized patients. Clin Toxicol (Phila), 2011. 49(7): p. 648-52. Colcrys Prescribing Information, I. Takeda Pharmaceuticals America, Editor. 2012: Deerfield, IL. Data on file at Gensco Laboratories, LLC.